WW1 Reenactments Equipment : Great War Tommy WW1 Documents, Paperwork : Standing Orders. WW1 Reproductions and WW1 Reenactors Equipment / Kit - Standing Orders. 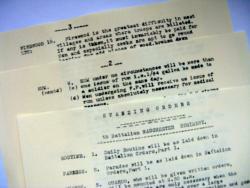 Copies of 4 typed sheets of Standing orders. (1918?) Details of 20 different aspects (usually warnings and restrictions!) including - gas, clothing, billets, firewood, crops, photography, smoking, horses, local inhabitants, baths, water and.......Rum.